I'm not writing about how to handle a crisis. I'm highlighting two of my favorite buttons in one of my favorite slices of software: Photoshop. Since I recently picked up a Nikon D40, it has become my best friend when I realize I still don't know how to use a camera and need some assistance in post-production. Plus, who couldn't use whiter teeth and less chins? Visit WebUrbanist to see several more and explanations of how they made the magic happen. I wouldn't mind having the dog you'll see to take out the trash and intimidate the UPS guy to remain on the porch until I get home. And then marry me. Who's a good dog? Thanks for sharing! Those were interesting! By the way, you are doing great on your photography!! 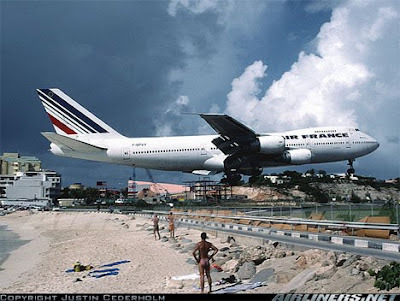 That plane picture is crazy - I can't believe that is real! That doggy made me sad.